On Run BTS! 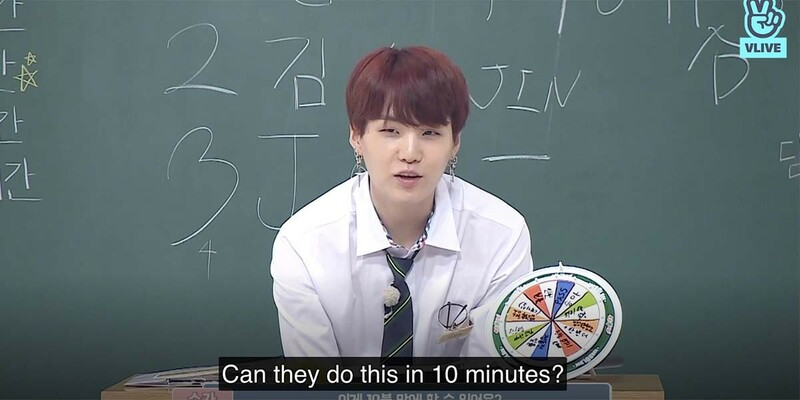 episode 63, BTS is back in the classroom and this time they’re learning from Yoongi instead of trying to win the heart of Yoonji! Run BTS! 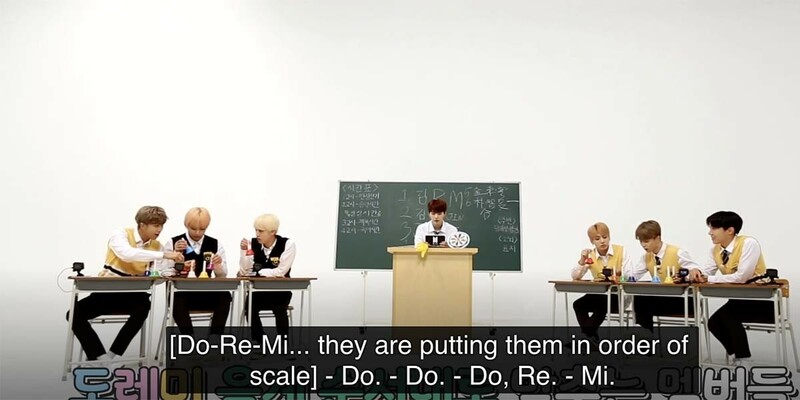 episode 63 opens right up to a chaotic classroom full of the Bangtan boys waiting for their teacher. 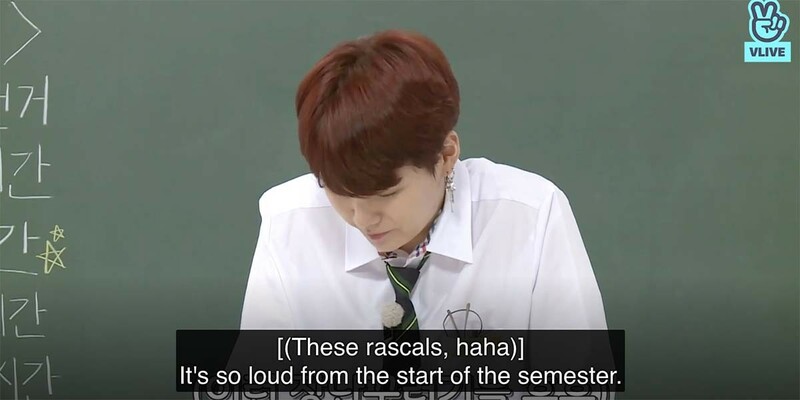 Just getting started with the roll call already has Yoongi sighing while the others act out. Minus Jungkook who seems to just need a nap. When Yoongi writes his name on the board as Min Suga, Taehyung doesn’t waste the opportunity to ask him about his underground rap days. “Teacher, I think I’ve seen you in a rapping contest with your hair styled up.” But of course, Yoongi brushes it off and tries to get the boys back in order. 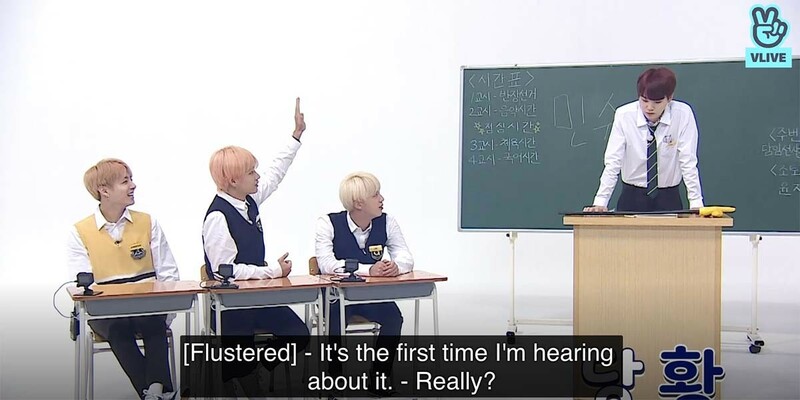 Yoongi tells the others that they’ll have four lessons in the class. First they have to divide into groups though. They use a modified version of rock-paper-scissors to pick the groups. In the end the Kim line all ends up on the same team. With Jungkook, Jimin, and J-Hope making up the second team. 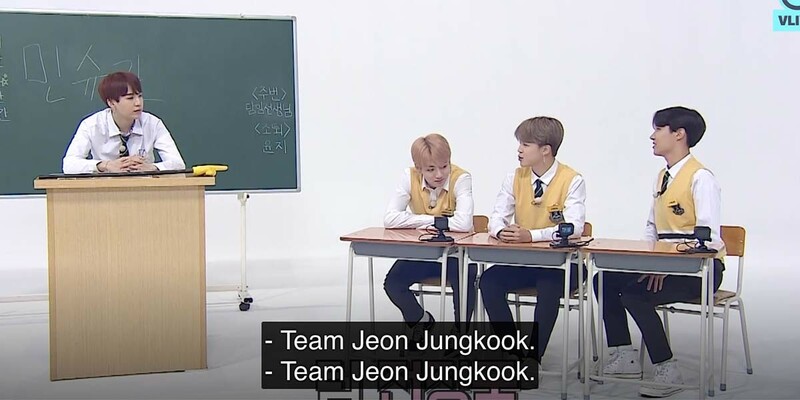 It’s Team Jeon Jungkook vs Team Kim Seokjin. Yoongi also reveals that he’ll be like a secret extra member. He picks a piece of paper from the staff to find out that his team is Jeon Jungkook. It’s the team that he said that he wanted but he can’t tell anyone yet. Next, they have to fill in the penalty wheel for the team that loses. For some reason they seem to go with pretty easy penalties. Maybe they’re all worried about who will lose this time? 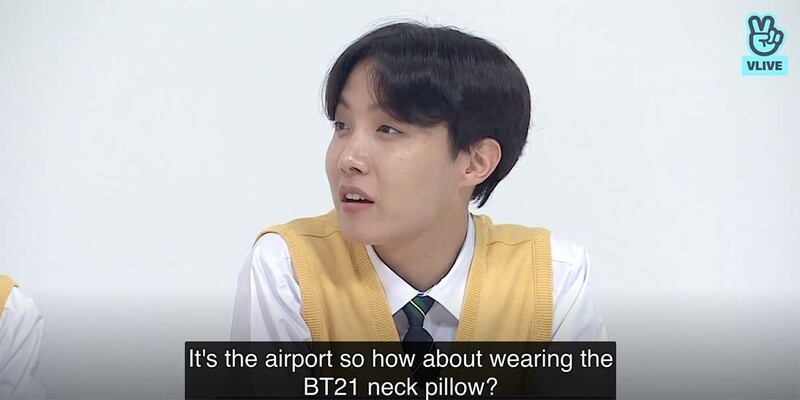 They land on the penalties of buying ice cream for the staff, wearing BT21 neck pillows to the airport, and wearing BT21 masks. Then it’s time to pick the class president. Each one of the students has to give a presentation on why they should be picked. Whoever wins will get benefits in the games. But first, they take the time to lament about how classrooms don’t use chalkboards anymore. Namjoon goes first, and nearly uses a pen to write on the chalkboard, but Yoongi yells to stop him. This makes the others weary about voting for him. Joonie gets nervous about his speech but promises that he’ll buy the others food if he wins. Jin goes next and tells them that there’s nothing he can do for them. But he promises to give them money for games if he wins. This already wins him some fans. They’re less impressed with his dance though. Hoseok goes third, and Yoongi seems to have high hopes for him. That’s before everyone teases him about how he writes his name on the board though. Hoseok promises that if he wins their class will be the best because they’ll dance really well. And he does impress them with his adorable dance. Jungkook is the nest candidate and they’re all impressed by his low voice. 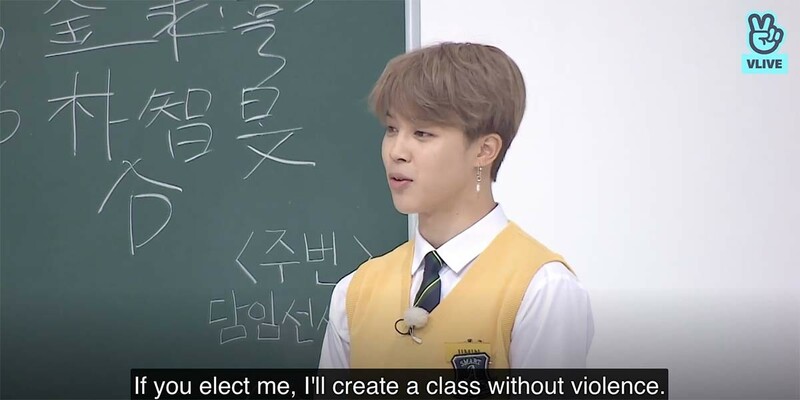 But he says that he’s not interested in being the class president. Somehow this makes the others want to vote for him more. Jungkook still wants a nap I think. Taehyung goes next and impresses them all with his Chinese writing. He promises that they’ll all be successful without any troubles if he wins. But when they ask if he can make them taller he says that’s genetics fault. 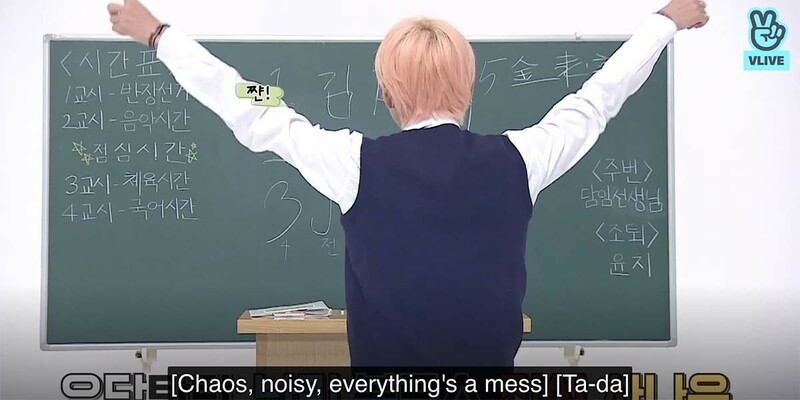 During his dance he almost hits Jimin and Hoseok with his pointer stick making everything chaotic again. Jimin is last and awes them with his writing too. He promises to create a class that’s peaceful and hardworking. The others think he’s charming and cute, as usual. They’re also excited for his dance which is aided by sound effects from Hoseok. To vote for the winner, they each get a ballot from Yoongi and have to write down who they want to win for class president. 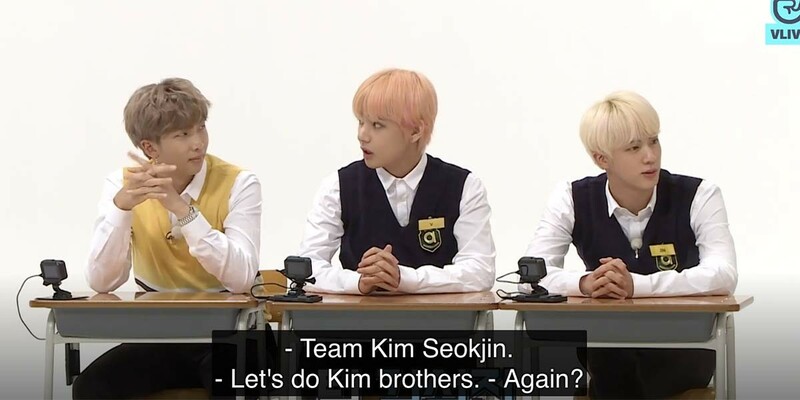 Even though it’s supposed to be secret, the Kim line all talks about who to vote for. While Jimin tries to steal peaks at who his teammates are voting for. The first vote is for Jimin, by Jimin. The next is for Jungkook by Hoseok, and the third is for Hoseok by Jungkook. While the entire Kim line voted for Jungkook. 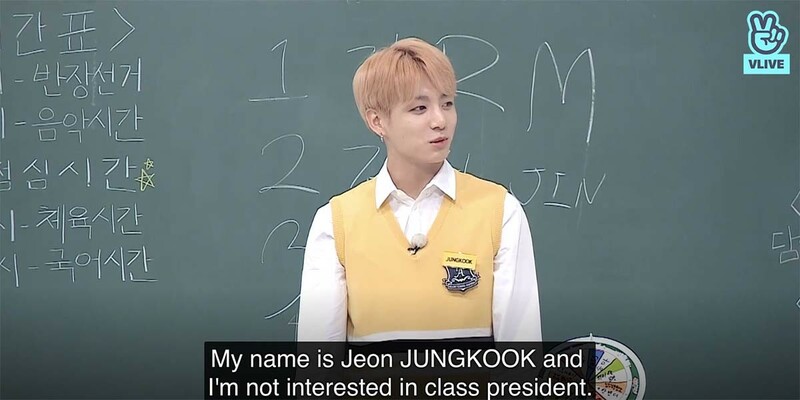 Which makes sleepy boy Jungkook the class president. They can finally get class started now, and it’s time for a music lesson. They are given hand bells and a song to play. With ten minutes to practice they have to learn the song and are given three tries to get it right. The classroom is quickly filled with the sounds of the boys trying to put the bells in the order of their sounds. The Kim line is excited to find out it’s a waltz that apparently Taehyung knows well. But then they get nervous when Jungkook’s team seems to do well in practice. Mostly it’s just ten minutes of lots of arguing, laughing, and random bell noises. While Yoongi wonders if anyone can pull this off. After ten minutes, Yoongi yells at them all to stop and that ends the episode! Next time we’ll get to see the boys actually try to play the song and the rest of their classes. Fans can watch Run BTS! for free on their official V Live account here! 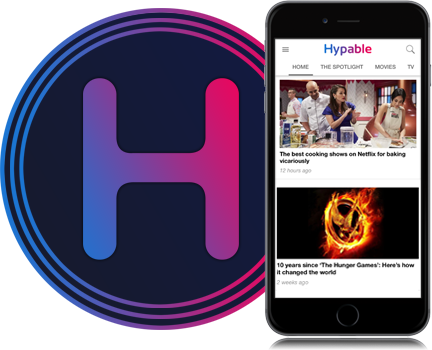 Channel + subscribers can also gain access to behind the scene clips and images. Run BTS! 2019 will air on Tuesdays at 9:00 p.m. KST / 7:00 a.m. EST! What was your favorite moment from ‘Run BTS!’ episode 63?